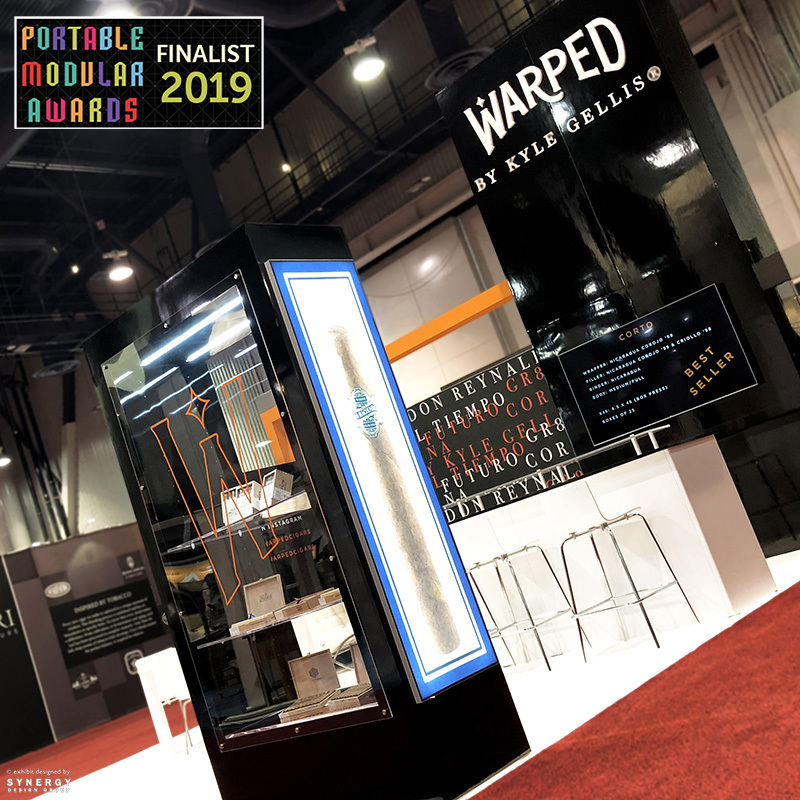 NEW ORLEANS, LA (November 29, 2018) — Synergy Design Group proudly announces selection as a finalist in EXHIBITOR Magazine’s 2019 Portable Modular Awards (PMAs). The annual competition recognizes outstanding exhibit designs “based on their aesthetics, functionality and innovation” (Exhibitor Media Group, 2018). This year, EXHIBITOR nominated TWO of Synergy Design Group’s booths for clients Warped Cigars and Ocean Infinity to compete in categories Best Island Exhibit Less Than 600 Square Feet and Best 10-by-10 Foot Exhibit, respectively. A panel of experts will decide the winners of each category. However, the public may vote online once daily until February 25, 2019, to select the People’s Choice design. The trade show and events magazine will present the winners at EXHIBITORLIVE 2019 in Las Vegas, Nevada. 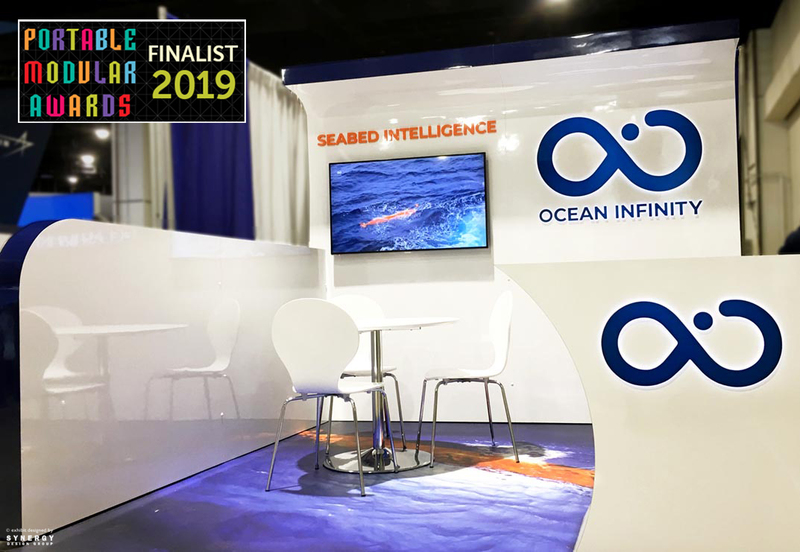 Synergy Design Group’s booth designed for client Ocean Infinity at the 2018 Sea-Air-Space Exposition in National Harbor, Maryland will compete as a finalist in the PMA’s Best 10-by-10 Foot Exhibit category. Inspired by the company’s brand and icon, the display design embodied a modern interpretation of the ocean’s flow. For example, a curved gloss wall and custom, contoured front counter with integrated tablet. In addition, dimensional tagline, custom graphic flooring and halo-lit signage enhanced the concept of tying technology into an organic environment. For more details of the nominated booths, please visit Synergy Design Group’s blog articles on Warped Cigars and Ocean Infinity. The exhibit design company encourages viewers to vote for their favorite booth once daily via EXHIBITOR Magazine’s online voting portal. Beginning the end of November 2018, voters may cast their choice until the competition closes on February 25, 2019. In 2014, Synergy Design Group won the PMA for Best 10-by-10 Foot Exhibit and the People’s Choice Award. However, the exhibit design company is excited for two booths to compete in two categories this year. Synergy Design Group is a woman- and minority-owned exhibit design company that develops award-winning trade show booths, display rentals, branded interiors, museum exhibitions and retail spaces. Synergy turns clients’ visions into exhibits that exude professionalism and credibility, generate qualified leads, increase visibility and promote products and services for small- to large-sized companies. In addition, the team at Synergy combines detail-oriented design, marketing and logistics to exceed clients’ expectations. For more information, call 504-522-6453 or visit www.synergy-dg.com, Twitter @SynergyDG and Facebook @SynergyDesignGroup. The leader in trade show and corporate event marketing education, Exhibitor Media Group publishes EXHIBITOR Magazine – Best Practices in Trade Show Marketing. […] EXHIBITOR’S website, www.ExhibitorOnline.com, is the trade show and event community’s most comprehensive online resource.